In review of the proposed new VA rule for Camp Lejeune, we find several items of interest that should be adjusted or considered. 1. “Adult leukemia” – Many commenting have already explained why this is vague, at best. A line by line specificity of coverage by type is warranted as replacement for this broad term. 2. Number of conditions – Please reconsider including, at minimum, ALL 15 conditions that were originally included in a 2012 Camp Lejeune law, along with adding any additional conditions that may have been recently added via CDC research since that time. 3. Federal civilian defense workers, spouses, children on base – Nowhere in this rule is any mention to include provisions which recognize that these constituencies were also exposed. Including this language would serve as a vital reference and precedent for other relevant agencies involved to move forward and take respective action for them. Some of those civilian workers, for example, were also previous war veterans and are not served by this rule. 4. “Camp Lejeune water supply” – In addition to simply ingesting contaminated water at Camp Lejeune, exposed individuals likely absorbed the volatile chemicals and carcinogens present from soil vapor that permeated many of the buildings on the base. Over time, this toxic soil vapor has penetrated buildings and the air in general, causing the need for installation of ventilators and measurement devices. There were also several reports of building evacuations due to the levels of vapor intrusion buildup discovered. “As part of the degradation by-product simulation using the TechFlowMP model, results also were obtained for VOCs in the vapor phase (above the water table in the unsaturated zone). Analyses of the distribution of vapor-phase PCE indicate there is potential for vapors from these plumes to enter buildings at Tarawa Terrace I, thereby providing a potential exposure pathway for inhalation of PCE vapor. At Tarawa Terrace I these buildings would include family housing and the elementary school.” – ATSDR Analyses of Groundwater Flow, Contaminant Fate and Transport and Distribution of Drinking Water at Tarawa Terrace & Vicinity, USMC Base Camp Lejeune, NC: Historical Reconstruction and Present-Day Conditions – Chapter A: Summary Findings, July 2007, page A68. Even more important, chemicals in the vapor can be inhaled or absorbed through the skin at a potency of 5x that of water ingestion. Therefore, exposure to concentrated soil vapor can be even more hazardous than drinking the contaminated water on base alone. This is why a proper and detailed soil vapor intrusion toxicity pathway should be evaluated, considered and included in current or future language. 5. 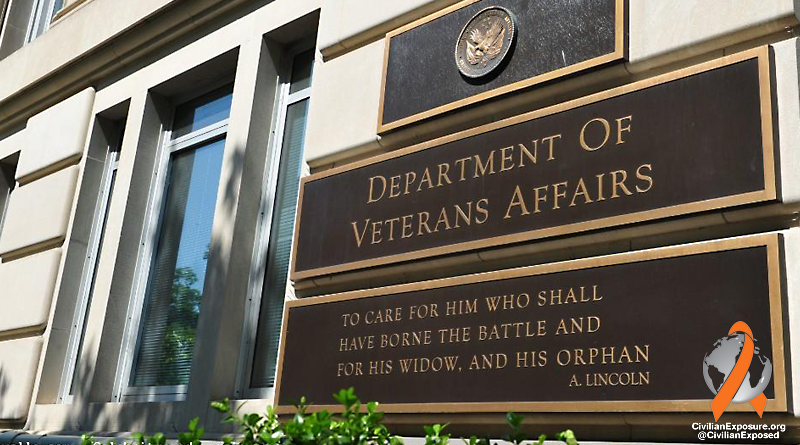 Timelines/Details of Implementation – The rule lacks specificity on the exact details of VA responsibilities for implementation. There are no exact timelines regarding implementation of the rule, on channels of communication and frequency of messaging about the rule change to constituencies involved, details on processing times and resolution for prior/existing/pending claims, etc. The VA has earned a reputation, fair or otherwise, of being slow to move on issues such as these. Increased specificity would help shift that perception. Along with all of the quantitative data presented in various other comments on this rule, we also urge you to consider the qualitative factors involved. This pollution and the poisoning involved took place for 30+ years. Resolution to this issue has dragged on for yet another 30 years. Perhaps it is time to move away from risk/cost mitigation tactics, incremental regulatory movements and hurdles, and finally address the pollution and results in totality. Go further and create an equitable resolution once and for all for EVERY citizen exposed at Lejeune. Do the right thing for those who have worked, served or supported the defense of our nation.